Chinese New Year just round the corner. Are you ready to welcome the year of Wood Horse with energy and enthusiasm? I was busy like a bee running around during the public holidays and weekend preparing for Chinese New Year (CNY). Well, it was tiring but I am happy and excited to meet my friends, cousins, relatives and family for reunion. Just can’t wait to see them again, usually we only get to meet some of them during CNY reunion because some of them have migrated abroad or busy with their work and family. So how is your preparation for CNY? 1. Spring cleaning – we will choose a good date usually during the weekend to thoroughly clean and tidy up the house. Plus throw all the unwanted stuff away. Hair cut – I m not sure why it is my family tradition that before CNY we will have to go for hair cut or trim. My mom said is to cut away the unhappiness and bad luck to get ready for New Year hopefully will abundance and good luck. We look good and fresh during CNY. 2. House decorations – the red lantern is up, auspicious Chinese calligraphy, flowers, get ready delicacies tray, sweets, CNY cookies and mandarin oranges. 4. Deliver Hampers – delivery hampers to the in laws and some of the close relative and friends. 5. 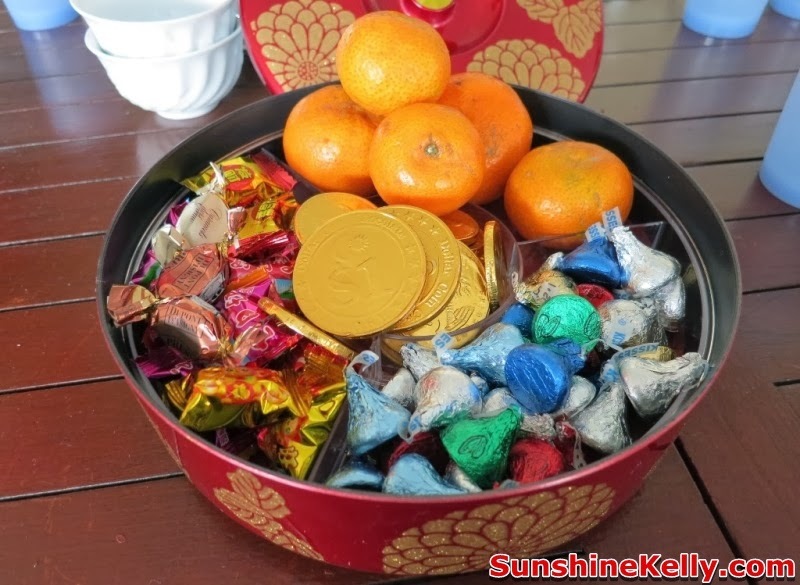 CNY Groceries – usually mandarin oranges, canned abalone & mushrooms, dried mushroom, Yeo’s packet drinks, peanuts, snacks, gold cake (nian gao), sweets, Jasmine Sunwhite Rice, beers, dried bbq meat and a lot of fresh food for the reunion and guest. 6. Hang red cloth– this is after the spring cleaning usually the guys will hang red cloth at house main entrance door. This is to invite the God of Prosperity to come to our house and also welcoming the guests. 7. Red packet and new notes – For those married people like me, red packet or ang pow packet is a must to get ready. Lucky that I have changed new notes from the bank beginning of this month, I am sure there will be a long queue at the bank this 2 weeks. 8. Fill rice bucket – is a must to fill my house rice bucket to the brim to signify a bountiful year ahead. The house will be filled with abundance and prosperity. To Asian, especially Chinese rice is very important it is the symbol of life, survival and food for the whole family. So do I missed out anything? If yes please highlight to me I will add into my checklist. I believe there are a lot more things to do and prepare for Chinese New Year. Hope that this year everything will be smooth sailing and auspicious.